American Girl® Expands into Canada | Mattel Inc.
MIDDLETON, Wis.--(BUSINESS WIRE)-- American Girl, a division of Mattel, Inc. (NASDAQ:MAT), today announced its expansion into Canada via the company's award-winning catalogue and two experiential store-in-store boutiques in partnership with Indigo Books & Music Inc. (TSX: IDG), Canada's largest book, gift, and specialty retailer. Opening in spring 2014, the new American Girl retail stores will be located in Indigo's Yorkdale Shopping Centre, Toronto, and Robson Street, Vancouver. "For nearly 30 years, American Girl has been celebrating and encouraging girls through age-appropriate dolls, books, and experiences. 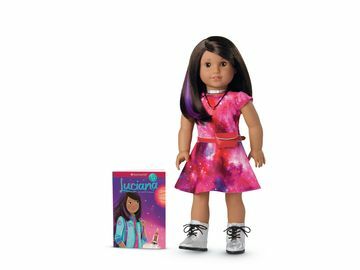 Now, for the first time, we are thrilled to take the American Girl experience beyond the United States and inspire a whole new group of girls to achieve their personal best," said Jean McKenzie, executive vice president of American Girl. "We're equally excited about partnering with such a well-established and creative company like Indigo. Its strong following and powerful mix of premium experiences offers an ideal way to introduce American Girl to more Canadian girls and their families." Indigo's Founder and CEO Heather Reisman said, "I've loved American Girl since its inception. My daughters grew up with American Girl. My granddaughters are growing up with American Girl. We at Indigo are thrilled to be bringing this iconic and inspired brand to Canada." Girl of the Year®—a modern-day character, launched annually, that comes to life via an original 18-inch doll, accessories, outfits, and books that reflect the interests and issues of today's girls. 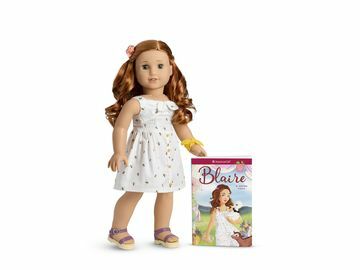 My American Girl®—a line of contemporary 18-inch dolls that allow a girl to select from several different combinations of skin tone, eye color, and hair-color to create a doll that's just right for her. A variety of books, outfits, and accessories round-out the play experience for girls. Bitty Baby®—a line of high-quality baby dolls available in 11 different combinations of skin tone, eye color, and hair-color, accompanied by premium picture books, outfits, and accessories that encourage nurturing play in girls 3 and up. In addition to the doll lines, the Indigo American Girl store-in-store boutiques will carry Dress Like Your Doll girl-sized clothing and a variety of best-selling American Girl books. Fans can also treat their dolls to a new hairstyle or ear piercing in the Doll Hair Salon and enjoy free girl-and-mom-friendly events and programs offered throughout the year. The new American Girl stores at Indigo are slated to open in spring 2014. Future announcements about grand-opening dates will be made as schedules are finalized. American Girl is a premium brand for girls and a wholly owned subsidiary of Mattel, Inc. (NASDAQ:MAT, www.mattel.com), the world's leading toy company. Since its inception in 1986, American Girl has been devoted to celebrating girls ages 3 to 12 through age-appropriate, high-quality dolls and accessories, books, clothes, movies, and unforgettable experiences. Best-selling lines include My American Girl®, Girl of the Year®, Bitty Baby®, and its classic historical characters. Headquartered in Middleton, WI, products are sold exclusively through the company's award-winning catalogue, on americangirl.com, and in its experiential retail stores. By inspiring girls to be their best, American Girl has earned the loyalty of millions of girls and the praise and trust of parents and educators. To learn more about American Girl or request a free catalogue, call 1-800-845-0005 or visit www.americangirl.com, www.facebook.com/americangirl, or www.twitter.com/american_girl. With books always at our heart and soul at Indigo we are about telling stories and creating experiences. Indigo is Canada's largest purveyor of ideas and inspiration to enrich your life, with books, specialty toys, gifts and lifestyle enhancing products that affordably offer intrinsic quality, beauty and timeless design. As the largest book and specialty retailer in Canada, Indigo operates in all provinces under different banners including Indigo Books & Music; Indigo Books, Gifts, Kids; IndigoSpirit, Chapters, The World's Biggest Bookstore, Coles and the online channel, www.indigo.ca.